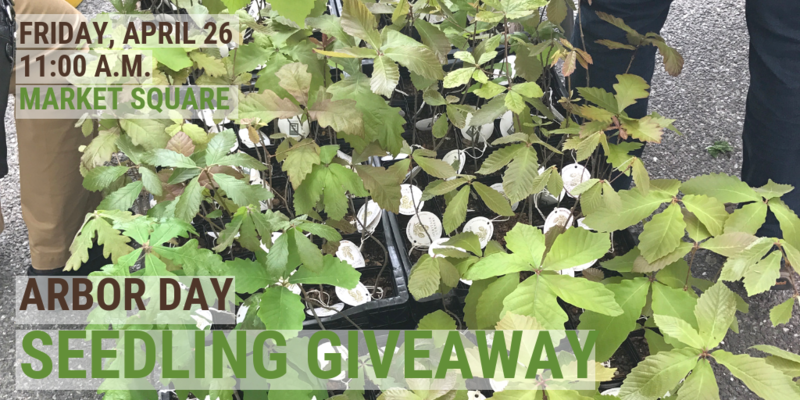 To cel­e­brate Arbor Day, Tree Pitts­burgh is giv­ing away tree seedlings in a give­away spon­sored by the Pitts­burgh Shade Tree Com­mis­sion! Did you know that all the seedlings we give away on Arbor Day are grown right in our own Her­itage Nurs­ery? We start each of these trees from seed, car­ing for them until they are ready to head into the world on Arbor Day. There is a lim­it of one tree per per­son. Trees are on a first come, first served basis. We can­not hold trees, and we will be in Mar­ket Square until 2 p.m. or until we give away all the seedlings — what­ev­er comes first. We may give away all the trees before 2 p.m. and can’t guar­an­tee when they will be gone, so if you want trees, be sure to get there at 11! We don’t know our species yet, but keep check­ing back.